Yesterday we posted Dayenu/Coming Home, the Ein Prat Passover contribution. 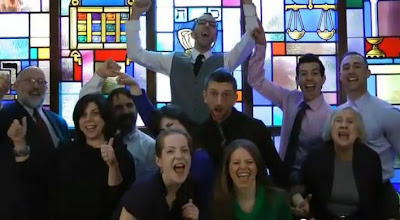 While we were typing away, the NJOP crew posted their entry on YouTube, following their successful pop parodies for Rosh Hashanah and Shabbat. It's called The Best Seder in the USA, a takeoff on Miley Cyrus' big hit, Party in the USA. Here it is for you to enjoy, followed by the original that it's based on. As for the Maccabeats, we hear they're busily working on a sequel to their Chanukah and Purim parodies. We'll share it as soon as we get it.